A hefty daily dose of omega-3 fatty acids and B vitamins, and some Ginkgo biloba, may protect the brains of people over sixty from aging. Researchers at the University of Roehampton in London discovered this in a sponsored study, which has been published in The Journals of Gerontology, Series A. The researchers experimented with two groups of women who were 60 years of age or older. Each group consisted of about a dozen women. 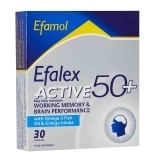 For six months, one group took 4 capsules of the Efalex Active 50+ supplement every day. Efamol, [efamol.com] the producer of Efalex, the British Efamol, sponsored the research. Every day, the women in the supplement group consumed 1 gram of DHA, 160 milligrams of EPA, 240 milligrams of Ginkgo biloba, 60 milligrams of phosphatidylserine, 20 milligrams of alpha-tocopherol, 1 milligram of folic acid and 20 micrograms of vitamin B12. The other group took a placebo. Before and after the supplementation period, the researchers had the women make cognitive tests, in which they determined, among other things, the memory functions and reaction speed of the subjects. The researchers also determined a few physical functions of the women. The supplementation also increased the women's walking speed, while in the placebo group it decreased. In elderly men and women, walking speed is a marker for mental health. "It must be acknowledged that this pilot study was not adequately powered for direct comparisons between treatment groups, and effects were only seen in some of the primary outcomes", the researchers write in the final sentences of their publication. "However, there were clear indications that supplementation improves cognition and mobility, which are important issues in successful aging." J Gerontol A Biol Sci Med Sci. 2016 Feb;71(2):236-42. Walnuts, chia seeds, linseed and other plant products contain alpha-linolenic acid, an omega-3 fatty acid. If you don't consume enough of this you may be more likely to develop dementia than if your diet does contain enough alpha-linolenic acid. Omega-3 fatty acids offer protection against depression, physical blows and falls, and lots more. Japanese researchers at the University of Hiroshima believe they have worked out how.